I should probably preface this with an apology. Okay, now that that’s out of the way, we can get down to business. 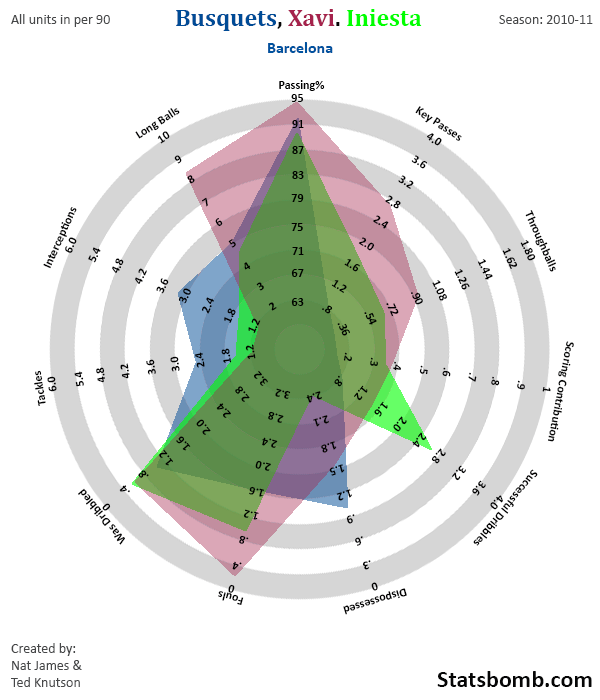 One of the things I have been doing lately is creating all sorts of radar charts to examine and compare player stats. Many people seem to like these. Some analysts have complained about certain elements (and there are notable weaknesses), but in general, I still think they are highly useful and add a level of approachability that you just don’t get from posting numbers. 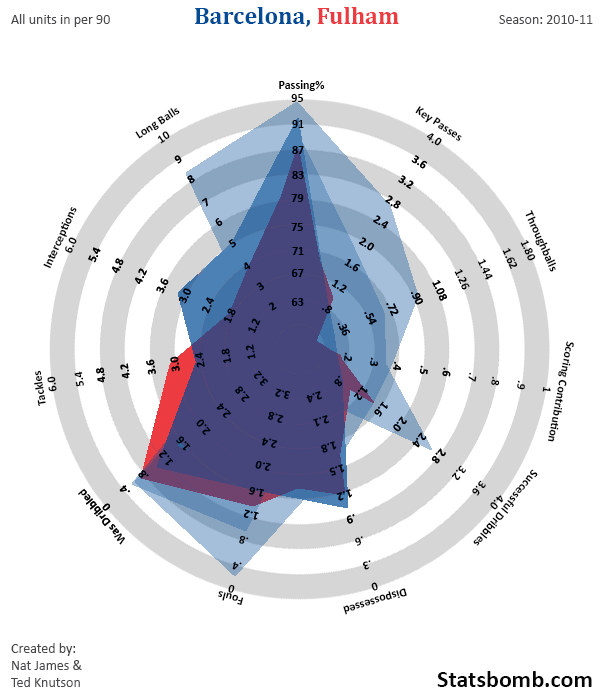 Anyway, almost immediately after I released the first midfielder charts into the world, I wondered if we could use the overlays to compared coverage of entire midfields. I was not the only one, since a number of smart people also popped up that same day asking the same question. That’s what we’re going to test out today. I’m just posting the overlays here up top, but for those of you who want to see each player’s radar, I have added an appendix down at the bottom so that you can go nuts. You can quibble a bit about the composition of any midfield, but like peanut butter and jelly, or Beyonce and Single Ladies, Busquets, Xavi, and Iniesta is one of the greatest combinations of all time. (Of all time.) Yes, there were plenty of times where Iniesta started as one of Barcelona’s wide forwards in a 4-3-3, but there are also plenty of times where this was the starting midfield combo that season. As you can see from the chart, each player has a fairly significant, and distinctive shape. Xavi is the masterful playmaker, with extreme scores in passing accuracy, key passes, long balls, and completed throughballs, who never commits fouls or gets dribbled past. His defensive contribution looks low, but it’s pretty solid for a guy whose job is not defense, and whose team controlled something like 70% of the possession that season. 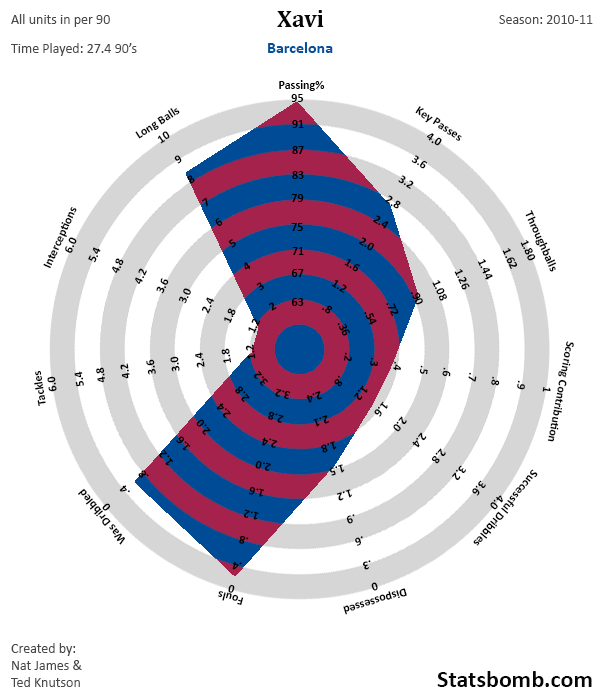 Iniesta is intriguing, as I don’t think I have seen a shape quite like his. 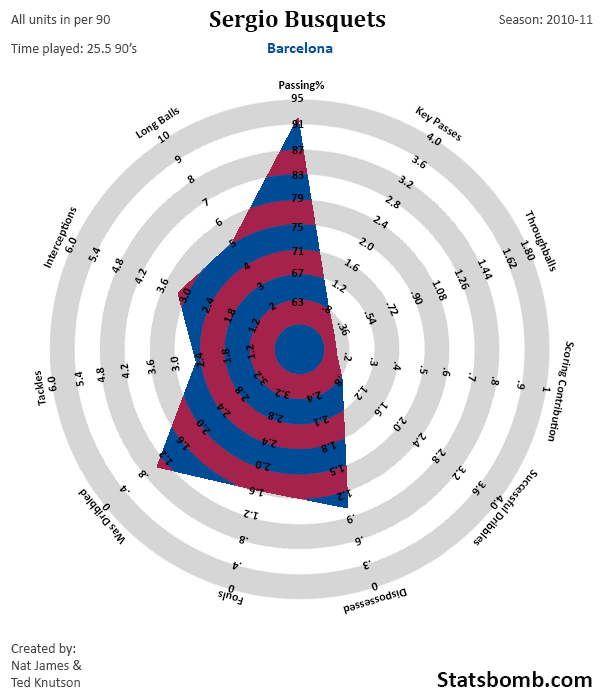 Scoring contribution (Non-penalty goals and assists per 90) is lower than I would have expected, but he has an excellent dribbling rate, and scores well in the creative passing stats (that throughball number is also great, and only looks weak next to the likes of a Xavi, Totti, or Cesc Fabregas). Additionally, his defensive stats are outstanding for that type of player, and he rarely fouls and never got dribbled past. This is the first time I have encountered a shape like Iniesta’s. 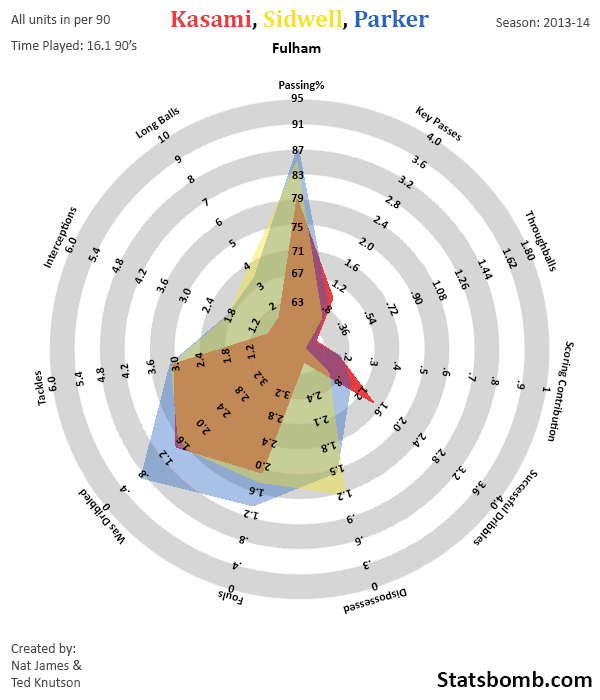 Busquets looks an awful lot like the charts of Mikel Arteta or Michael Carrick, with like a 10% bonus added everywhere. He is the prototype midfield destroyer and recycler, but he’s also a capable offensive passer as well. He’s also only like 22 years old in this season, which is pretty amazing. 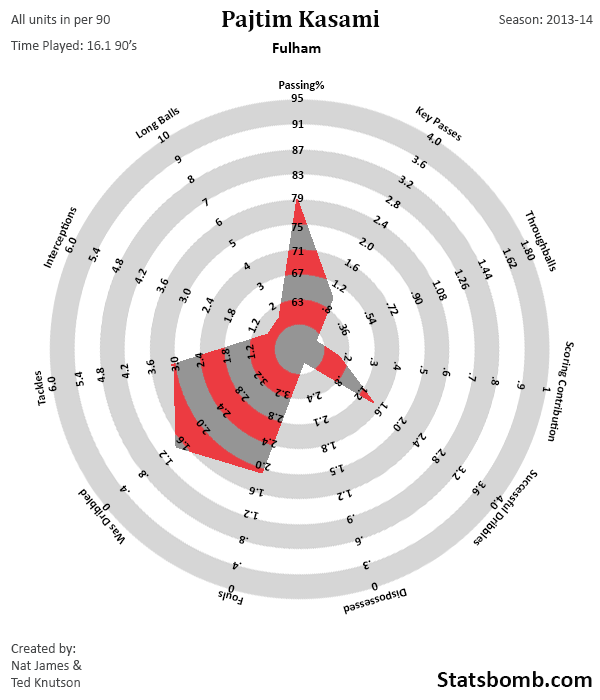 Okay, now because I wanted to compare extremes to test if total midfield shape overlays would be useful at that level, I have chosen the team who has one of the worst midfields in the Premier League this season. Formation is a bit different in that Fulham have varied between a 4-2-3-1, 4-3-3, and 4-4-2/1-1 this year, but it basically always involves Sidwell and Parker and usually Kasami in some capacity (the central attacking mid in the 4-2-3-1). I could put the occasional 4-3-3 partner of Karagounis in here, but that just makes it worse. You know all those big spikey swathes of coverage Barcelona’s midfield has? Fulham has none of that. In fact, Fulham gets basically nothing offensively out of their midfield. The lack of performance there is shocking. Sidwell and Parker do post solid tackling and interception rates, but that’s probably a result of the fact that opposing defences are always running at them. It’s also interesting to note that all three of the Barcelona midfielders complete more long balls than any one of the Fulham players, something you don’t really expect if you buy in to the Barcelona equals short passing mythos, but then again, they complete so many passes a game, some of them are bound to be longer, right? Anyway, initial test complete. 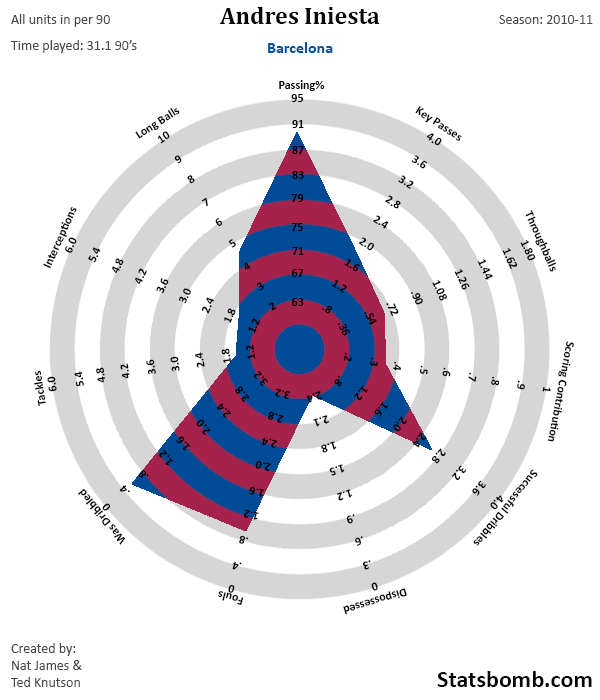 Barcelona’s midfield overlay covers a ton of area on the radar chart, with multiple players looking fairly amazing across a number of metrics. Fulham’s overlay covers very little area, with almost no offensive output, and little good stuff in general beyond some ability to tackle. 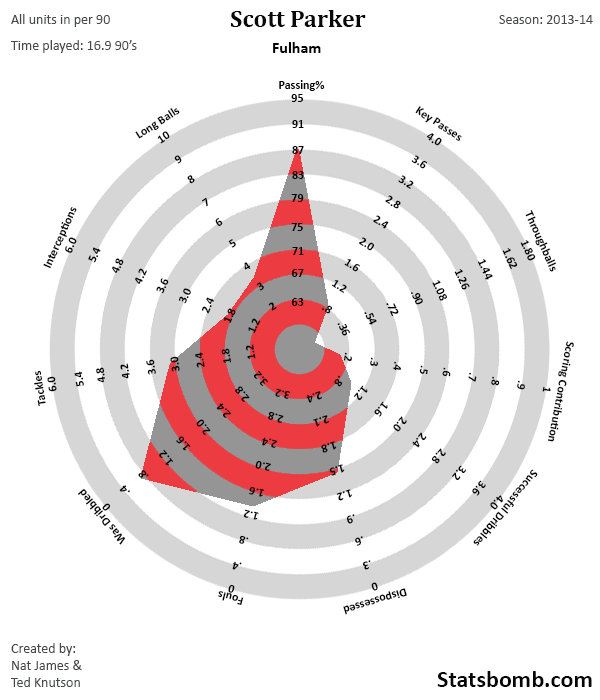 With that out of the way, expect occasional follow-ups doing midfield output comparisons, and potentially looking at attacking overlays as well. Every article won’t contain these going forward, but expect to see them regularly for a while, as I keep testing and refining the concepts.